HONOURS Agnes Borthwick received no honours, despite her invaluable WW1 service as Works Manager of a large Munitions Factory. 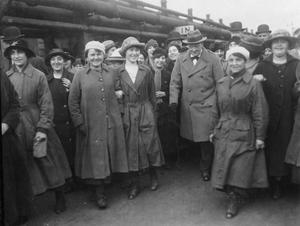 During a visit to the factory in October 1918, Churchill paid tribute to the “vast new army of hundreds of thousands of women workers”. Working in dangerous conditions, the women shared with soldiers some of the risks associated with the struggle, and afterwards they would share in the glory and honour of victory. It seems that the contribution of Agnes Borthwick was not recognised as this speech appeared to promise. Agnes Borthwick had an arts degree, but there is no record of any artistic interests she may have possessed. While she worked at the factory, there were opportunities for her to participate in many different cultural activities, and she may have done so. Honours MA degree from Glasgow University in 1912. Was awarded research scholarship, and spent 2 years in the USA, at Bryn Mawr College, then the University of Columbia, New York, and Radcliffe College, Cambridge, Mass. She returned to the UK around the time of the outbreak of war. 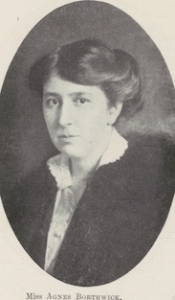 In 1915, Agnes volunteered following an appeal from the Ministry of Munitions for women workers. She undertook training at Woolwich, for which she obtained a first class certificate. Working in the Munitions Factory at Georgetown near Paisley, with supervisory responsibilities. She was sent to the factory shortly after it was established, so her first jobs would have involved preparing the new factory buildings – scrubbing and cleaning, and unloading shell casings. The women worked in shifts of 8 and three-quarter hours, and either commuted from neighbouring towns, or lived in hostels on site. She played a prominent role in the essential manufacture of munitions for use in WW1. Her job would have required her to understand engineering processes, have expertise in the handling of high explosives, employ and train inexperienced staff, and have a thorough knowledge of health and safety procedures, alongside the responsibility for the efficient supply of ammunition for the war effort. High importance was put on the welfare of the employees, and they were relatively well paid. In a few months she helped develop the factory from a few sheds to a large industrial complex. By the end of the war, the total number of shells filled at the Factory was over 19 million, and the number of cartridges filled totalled over 27 million. Because the factory buildings covered a large area, and managers had to move between buildings as part of their normal work, it was sometimes difficult to find Agnes or her fellow managers at headquarters when they were needed. A whistle-call system was introduced, with a distinct call being allocated to each manager. So, if Agnes were to hear her own call, she would locate the nearest telephone, and contact headquarters to find out what the problem was. 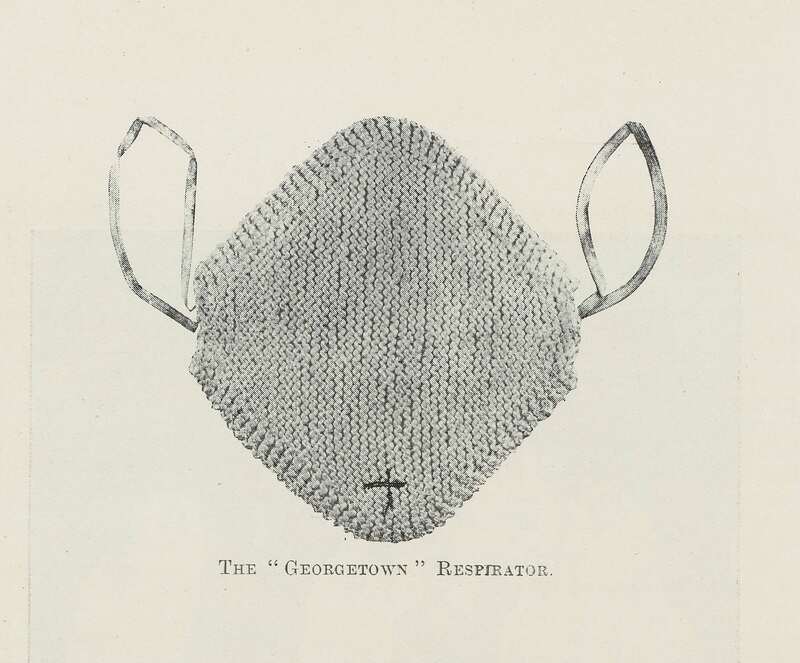 Those working with toxic substances in the factory such as TNT, were issued with face masks, called ‘Georgetown respirators’. Incredibly these were hand-knitted to a specific design. 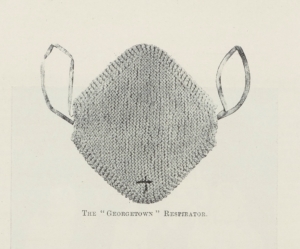 They covered the mouth and nose, and had elastic ear loops. Each day, they were washed in boiling water and ironed to sterilise them. Eventually one unidentified village in Scotland supplied nearly all the respirators for the factory. 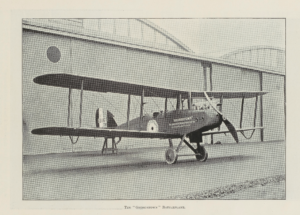 In 1918, the workers at the factory raised £2,500 from their own pockets to buy and donate to the Royal Air Force a fully equipped battle plane, named after the factory. This went into active service in France. The employees at Georgetown contributed to a fund to support anyone who was ill, or had suffered an accident. They also raised funds for the Red Cross, and responded to appeals for help in knitting socks for soldiers, and sewing overalls for nurses on war service. Georgetown workers campaigned vociferously for their industrial complex to be retained after the war as a permanent garden city, with factories and nearby housing for workers in healthy surroundings. Their deputation failed, and thefactory buildings were demolished and the contents put up for sale, including furniture, fittings, machine tools, catering equipment and even two pianos. 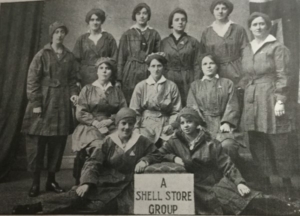 It was rare in her day for any woman to be appointed to the top level of management in industry, and it seems that Agnes Borthwick became the most senior female munitions factory manager in the whole of the UK. After the war, Agnes Borthwick married a mining engineer, Symington Macdonald, and brought up a family. There is no record of her continuing with a professional career.